This book, with its two enclosed compact discs, has been prepared especially to aid communication among building contractors and subcontractors, carpenters, plumbers, electricians, heavy machinery operators and others in the construction industry, where both English-speaking and Hispanic personnel work together. 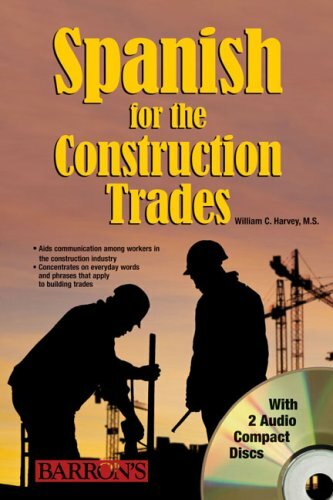 Author William Harvey provides an informal, user-friendly approach to Spanish, concentrating on everyday words and phrases that apply to the building trades and to related skills and professions. True-to-life bilingual dialogues, presented in the book and dramatized on the compact discs, recreate work and work-related situations. The compact discs offer the added bonus of listening comprehension and Spanish word pronunciation. If you have any questions about this product by Brand: Barron's Educational Series, contact us by completing and submitting the form below. If you are looking for a specif part number, please include it with your message.